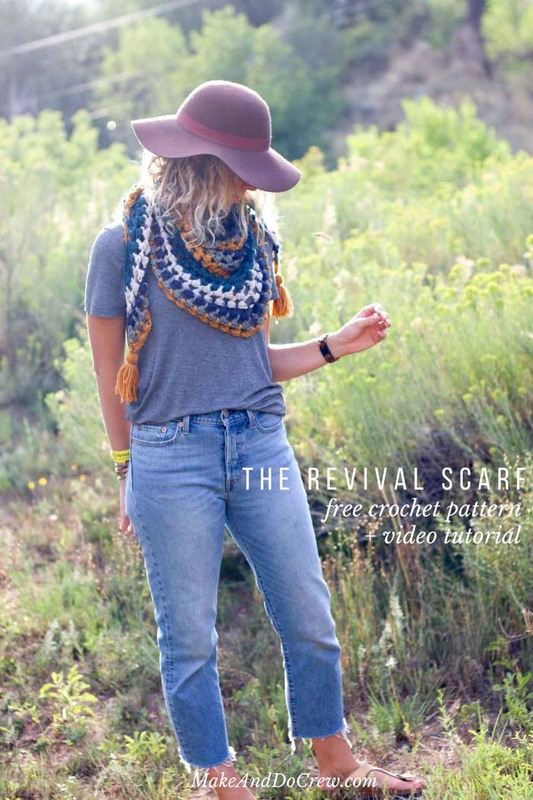 The Revival Crochet Triangle Scarf - Free Pattern and Video Tutorial! 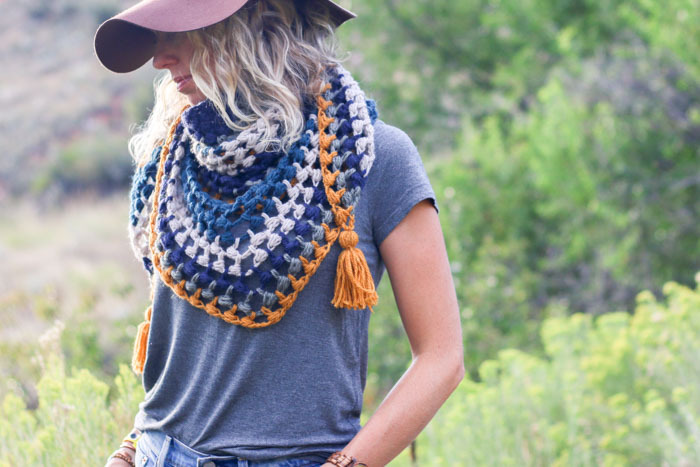 The Revival Crochet Triangle Scarf – Free Pattern + Video Tutorial! 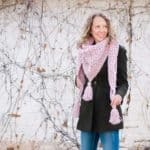 Worked in a muted, vintage color palette, this crochet triangle scarf free pattern is a versatile piece that’ll keep you cozy until the tulips start blooming again. Get the free pattern below or purchase the ad-free, printable PDF for $2.75 here. This crochet triangle scarf free pattern is part of an ongoing partnership with my friends at Lion Brand Yarn. This post contains affiliate links. For this crochet triangle scarf free pattern, I got to try Lion Brand’s Merino Yak Alpaca yarn, which is filled with beautiful, nature texture and comes in a color palette that just sings “pumpkin spice latte season!” I had a really hard time deciding which color to leave out of this design, but once I began working, these five colors felt perfect together. This crochet triangle scarf free pattern is one of those that is really quite simple once you get the hang of it, but it might look a bit intimidating to some. That’s where the video tutorial comes in! I put this together because I know some of you far prefer to learn through watching. So take a peek at the video below and then just reference the written pattern under the video for when to change colors. I’m always working on making my teaching more helpful to more people, so if you have any feedback on this video or types of instructions you like to see, please feel free to leave a comment! And you can always check out all my crochet video tutorials here. Please do not publish or share this pattern as your own. You may make items to sell with this pattern. In exchange, please link back to this post. Do NOT use my photos as your own sales photos. ­­You can read my policies here. Purchase the ad-free, printable PDF here. Add this pattern to your Ravelry favorites here. Pin it for later here. 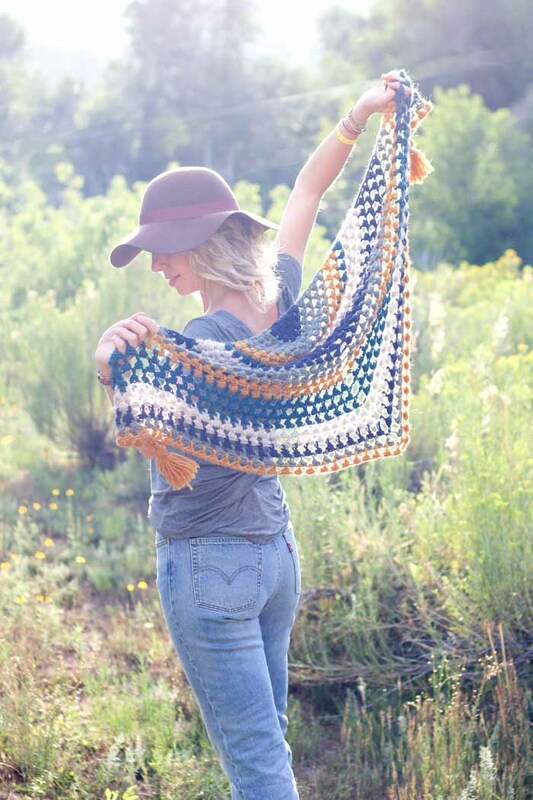 Worked in a muted, vintage-inspired color palette, this crochet triangle scarf free pattern is a versatile piece that’ll keep you cozy until the tulips start blooming again. 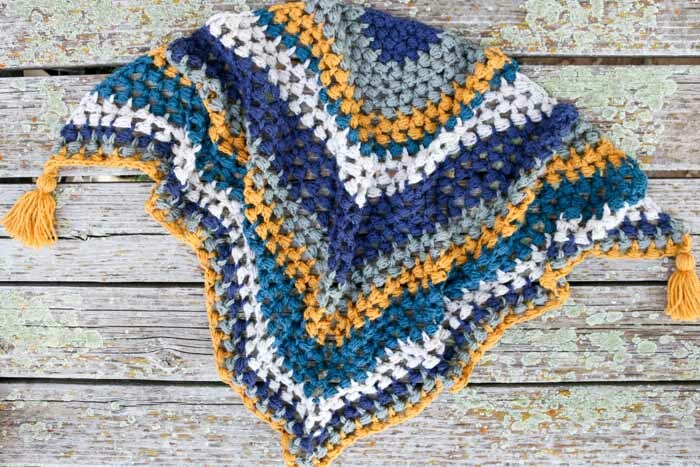 You’ll find the pattern quite easy to memorize after a few rows and the bobble-like stitches combine for a speedy little project with beautiful drape. Follow the pattern as written or add additional rows to create a larger wrap. 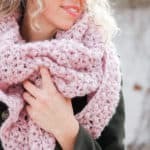 So you can spend more time crocheting and less time shopping, this pattern contains affiliate links at no extra cost to you. • Reference the video tutorial above if you need additional help with any aspect of the pattern. • In each row, the pattern increases by one bobble (cluster) on either side of the triangle. • Work the final dc of each row loosely so as to ensure your triangle has fairly straight lines. • The ch 4 at the beginning of each row counts as 1 dc and 1 ch throughout. Therefore the turning chain from the previous row is always the first ch1sp of the next row. • Optional: place a marker in the ch4sp that will form the triangle point to easily keep track of where to work a ch 4 on the next row. Switch to Color B. Fasten off Color A. Switch to Color C. Fasten off Color B. Switch to Color D. Fasten off Color C.
Switch to Color E. Fasten off Color D.
Switch to Color A. Fasten off Color E.
Switch to Color B. Fasten off Color E.
Because we’re working with natural fibers, I recommend taking the time to gently block the scarf to clean up any shaping inconsistencies and help it drape nicely. You may find that the longest (top) side of your triangle is a bit curved, which is fine and will make it wrap well around your neck. I find it easiest to weave the yarn ends into the nearest bobble, which hides them and keeps them secure at the same time. I promise the weaving will go faster than you think! Toss your new triangle scarf around your neck, grab a warm apple cider and start planning the next revival! 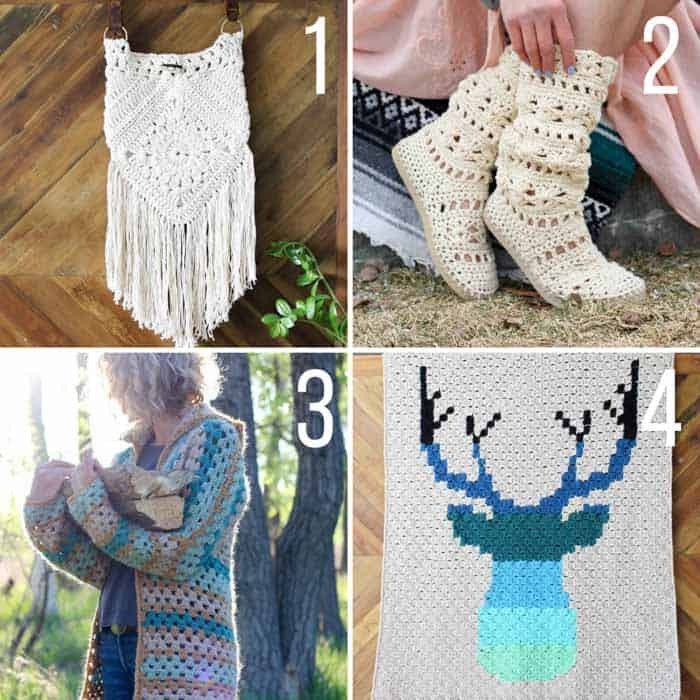 Now that you’ve got the perfect triangle scarf, you might enjoy adding these pieces to your handmade home and wardrobe! 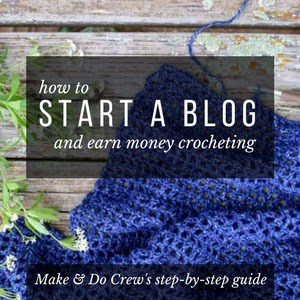 WANT MORE FREE CROCHET PATTERNS? I've got more free crochet goodness for you that'll knock your little handmade socks off. Hi! The revival scarf looks beautiful, but I can’t find the free tutorial. Can you please guide me. 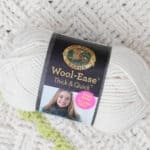 Love the video (super helpful) and love that this yarn is on sale right now! I’m so excited to get started on this. I have a question though. Is this pattern made using worsted? Under supplies it says the yarn is a super bulky, but the link shows that it’s worsted, it didn’t quite look bulky to me but I just wanted to double check before I get started. Thanks for all the great patterns!!! Yes! Thank you so much for catching that. It is indeed worsted. I’ve corrected it now. The pattern says it’s a 6 bulky yarn but the yarn says it’s a 4. So my question is what size yarn is it??? Thanks for catching that, Iola. 🙂 It is actually a size 4/worsted yarn. I’ve corrected it above now. Happy crocheting! I hope you enjoy it, Jewey! I can’t wait to make this but can’t find this particular yarn in Canada. 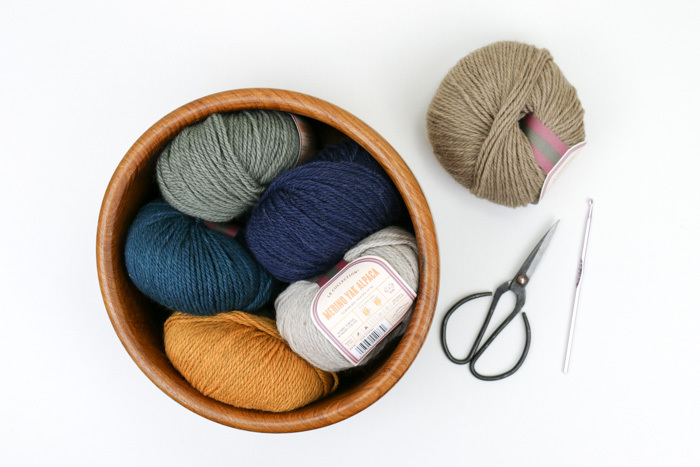 Do you have any suggestions for alternate yarn? Thanks!! Thanks Jess! Just trying to avoid the crazy shipping, exchange, and possible duty! It’s such a nice looking yarn. I will continue the hunt! 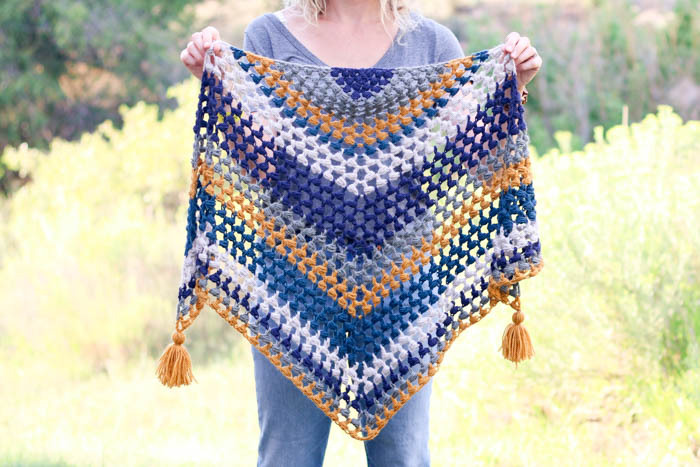 Love this pattern, and really appreciate the video tutorial. Can’t wait to get started! Yay! Hope you enjoy it, Bobbi! Hello, I’m having trouble getting the video to play. Once I click on it it go blank. I have finished up the scarf but i have never blockked an item do you have suggestions for blocking ? If you’re using acrylic, you can pin it down and then gently steam it with the steam setting on your iron. Just be sure not to actually touch the iron to the yarn or it will melt it! Thanks for the tutorial! I’m well into my scarf and notice it’s more diamond shaped then triangle. Any advice to correct the shape? My sample scarf had somewhat of a similar shape, although it sounds like maybe the curve at the top was less pronounced. I mention in the pattern (I think it’s in the blocking section? ), that you scarf might have a bit of a curve at the top, but that most of it will smooth out with blocking. You can see in the photos that the slight curve gives it a nice drape near your your chin when it’s wrapped around your neck. If you’re very dissatisfied with the shape though, you might be able to try adding an extra chain between each bobble to make each row longer. This might result in the opposite problem of a curve the other direction, but you may decide that’s fine with you as I don’t think it’ll show when you wear the scarf. Similarly, you might try just exaggerating the size of each chain between the bobbles in order to make each row slightly longer. Thank you, Jess!! 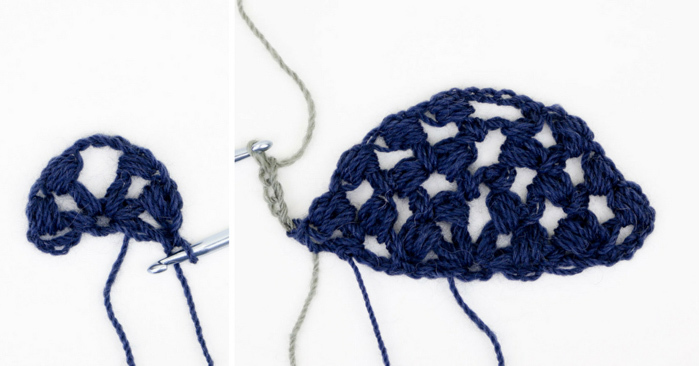 I’m a tight crocheter, and I was having the “diamond-shape” issue too… but exaggerating the size of the chains between the bobbles helped a lot! Thank you for this pattern – it’s fantastic! So squishy and comfy too!! I’m so glad that helped! If I wanted to make this pattern with only two colors how many skeins of yarn do you think would be needed? How beautiful is this, and just my mom’s style. I’m new to crocheting but your plan is so simple i Made one for her for a Christmas gift in a few weeks, but it seems SO small. It even seems small on me, and she is a bit more broad shouldered than I am. How would you suggest I make it larger? Just add a few more rows? I love this pattern! I don’t crochet a whole lot but i usually try to do at least a couple things during the winter when we have downtime and this was just the ticket! I’m about halfway through it and it looks beautiful so far!